Congratulations to Casey Johnston & Joe Lipari, for being selected as Technology Integrator’s Top Talent Under 40. As the President and VP of Sales & Marketing (respectively) Casey & Joe worked in tandem to expand Serious Audio Video’s business and exceed customer’s expectations. 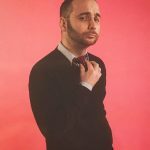 With Casey designing impressive systems and Joe raising brand awareness they grew from a local boutique agency to an internationally known industry leader. The honorees in this year’s Technology Integrator Top Talent Under 40 program are nominated by those in the industry who look up to their prowess, leadership, and influence in the community. Their mention here is recognition of a cumulation of several factors: their investment in years of hard work, their innate maturity exhibited in all the time leading up to this stage of their careers, and their determination to live by deep-seated principles that were oftentimes instilled by strong-willed and influential family members and industry mentors. As the founder and president of Serious Audio Video, during that first year, Casey was the only employee. 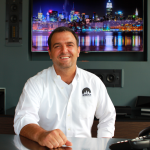 Relying on word of mouth to grow his business, he designed and engineered most of the smart homes in Hoboken, NJ.Winner of 2 CI Integration Awards, an Industry Leader in bar/restaurant and retail systems, a top dealer for URC and Elan; Casey has even appeared on HGTV’s Dear Genevieve. When he joined the company, we barely had a website. Joe focused on our brand messaging, structured our consulting efforts and brought us way outside our usual service area. Now that we’re available internationally, we’ve engineered designs for some projects outside the US; including a luxury residential community in Anguilla and the biggest sports bar in Cairo, Egypt. Technology Integrator is a business strategy magazine for the residential A/V and automation integration electronics professional. Each issue of Technology Integrator is crafted like an exclusive management conference. Business coaching from respected professionals stimulates and educates those who are ambitious for success. The core columns, departments and features are focused on training, employee retention, business management, marketing and merchandising from respected experts in their fields. New voices in the publication address legal advice, financial planning and employee compensation, rounding out the portfolio of topics represented in the magazine. Just as our readers aspire to be expert advisers and resources to their customers, Technology Integrator targets owners and managers who are passionate about their businesses. New technologies and applications are advancing every day, providing plenty of reasons for readers to work in their businesses. Technology Integrator ‘s objective is to help our readers work on their businesses.